Hot Pink Personalised Chefs Apron with a name, initials or title monogrammed to make a truly special gift. Hot Pink Personalised Chefs Apron with a name, initials or title monogrammed to make a truly special gift. Unique and useful gift idea for men and women and suitable for any occasion, home use or catering! Enter your text. Hot Pink Personalised Chefs Apron with a name, initials or title monogrammed to make a truly special gift. Unique and useful gift idea for men and women and suitable for any occasion, home use or catering! Enter your text. Choose the thread Colour and font style. We use poly-cotton high performance chefs aprons made using a 65% polyester and 35% cotton blend for durability, softness and easy care. Has adjustable pullover neck strap and long waist ties so you can adjust to fit most all adults. Great for light to heavy duty cooking, Professional Catering and Chefs, or just cleaning and barbeques! Adult size apron measures 72cm wide x 86cm long. 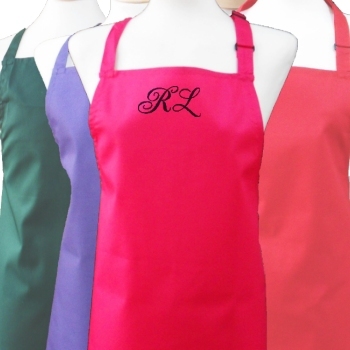 Our Personalised Aprons also available a variety of colours and in child sizes too. Amys Gifts personalised this item to order aim to dispatched within 2 working days. Any queries or special requests please email us.